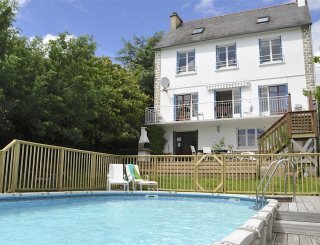 Le Pavot, La Tranche sur Mer, Vendee, France, sleeps 5-11 in 5 bedrooms. 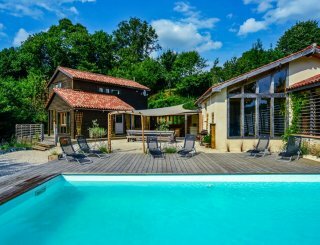 The villa is just a 10-15 minute walk through pine woods, along a cycle track, to the superb long soft sandy beaches the Vendee is famous for, and within walking distance of the delightful French seaside town of La Tranche sur Mer, one of the loveliest and most unspoilt holiday destinations in France. 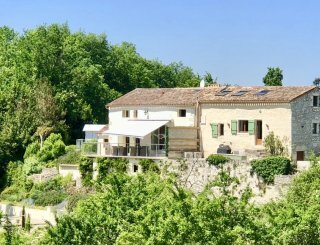 With a large private heated (all year round system) pool, garden, wireless broadband, and all mod cons, Le Pavot is the ideal place for a self catering French rental holiday. Excellent facilities for families and also perfect for groups of friends. The heated pool is 5m x 10m in size,with security fencing and locking gate for additional safety. 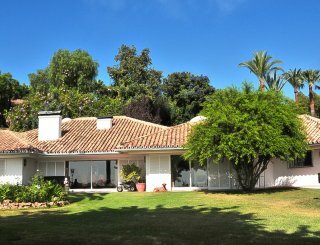 The villa is south facing, and double doors from the lounge lead to the pool and garden. The Vendee is situated on the west coast of France and features mile upon mile of golden sandy beaches that slope into the clear blue sea. It is the perfect place for water-sports of all kinds or relaxing in the sun, with monitored bathing and surfing school on the local beach. With its wonderful west coast climate, it is the perfect place for family beach holidays. Explore the beautiful French countryside, visit Roman remains, world famous Cognac or take a trip to grand old cities or famous chateaux, there is plenty for everyone in the Vendee. The Vendee area is also famous for its wine. 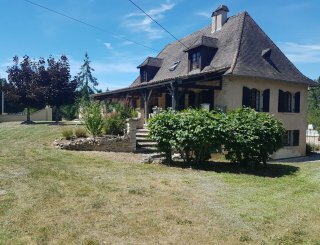 boasting acres and acres of vineyards that produce wines such as Muscadet and Gros Plant. La Rochelle is only a short distance away, the site of France's 2nd largest boat building port and the historic Vieux Port, which remains largely unchanged. A daily fish market can be found in the old town until 12:00 midday. The port is very attractive and waterside cafés and restaurants offer a relaxing break. The seafood platters are their speciality and are excellent especially for large groups, where a single huge dish of shellfish is produced. There are also many other picturesque towns and fishing ports to explore in the area. Large modern kitchen with breakfast bar and all mod cons. Dishwasher, microwave, fan oven, electric hob. Utility room with wash m/c & vented dryer. Dining area with lounge doors opening to large covered patio area and paved area around heated pool. Large lounge area, fireplace, high spec TV, DVD library, Sat TV. Hifi, high spec TV, DVD player, DVD library. There is no games room, but there is table tennis in the garden. Large traditional fireplace/log burner with large supply of pre cut oak logs. 2 bathrooms (one with bath, other with shower) plus 2 separate WCs. Five bedrooms [Bedroom 1 - King size; Bedroom 2 -Twin singles; Bedroom 3 - King size; Bedroom 4 - Bunk beds; Bedroom 5 - Bunk beds + Single Bed]. Linen provided, included in price. Towels can be provided at additional cost. There are no facilities specifically for disabled guests. Selection of games, books and DVDs. Heated pool, table tennis table, outdoor seating. 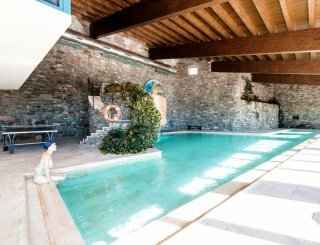 Large private pool with high spec heating system, fine April through to November. Parking for 5 or 6 cars. 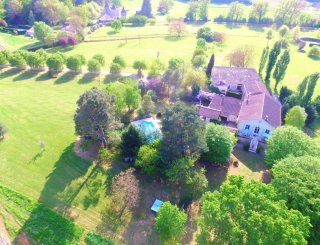 Le Pavot is within a small private estate, Quichenottes, recently created in the woods near the beaches on the edge of La Tranche sur Mer, between the villages of La Terriere and La Tranche. 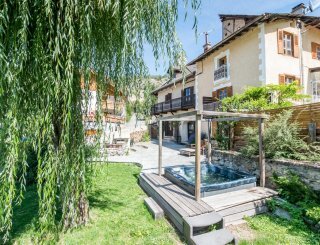 400m, just a few minutes walk to bakery, restaurant, café. Private heated Pool available Easter through to 1st week in November. £200 per week booking deposit. Balance plus £100 key/security deposit 12 weeks before you travel. Guests are advised to bring a car.